67" x 24" x 2"
Memory Foam Yoga and Exercise Mat enhances your stretching and exercise routine by making it a more cushioned and comfortable experience. It is great as a travel bed for travel and camping. Your mat is protected by removable, washable cover. 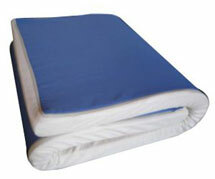 Great for Pilates, Yoga or a travel bed for camping.